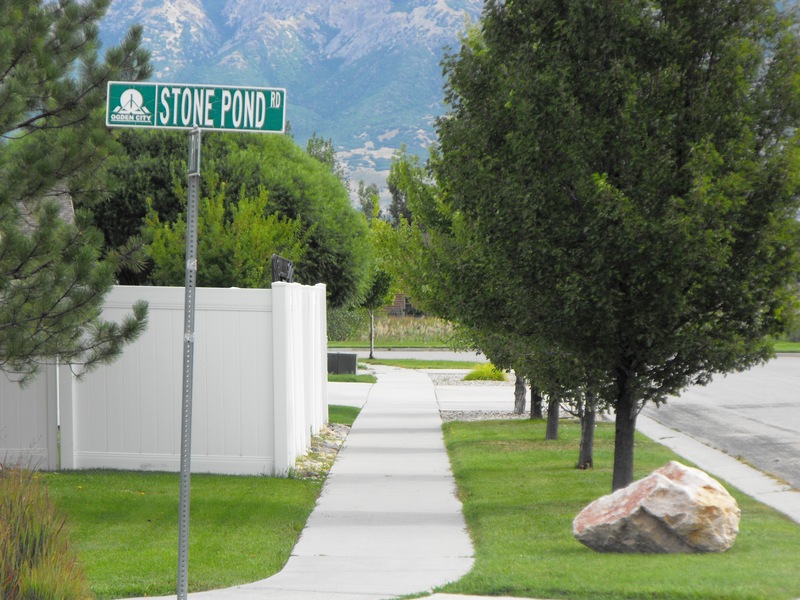 TODAY: Stone Pond Road named for Stone’s Pond; James Stone bought the pond from Sam Gates and built a cabin beside it in 1872. 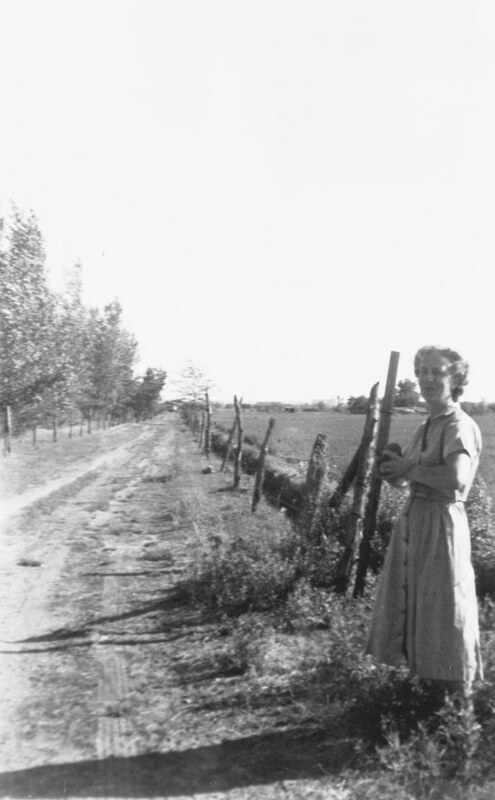 Clara Stone on the old Stone Pond cow lane in 1938. 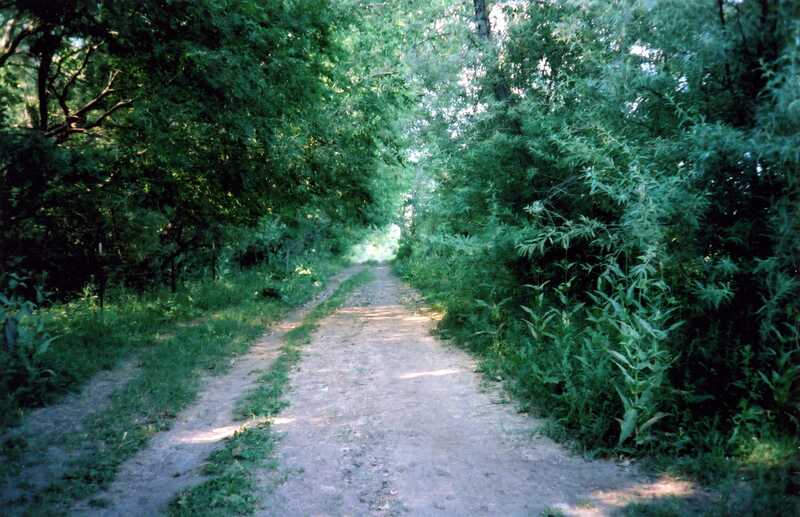 1997- Lane to Stone’s Pond; photo courtesy Bridget King. Stone’s Pond was named for James Stone who built a cabin beside it in 1872 . “Father built a log cabin of only one room, but it was a very large and comfortable room. He purchased a meadow which had on it a very large pond of water. It also had a spring of lovely drinking water on it. There were fish in the pond; we had a boat and use to ride out and fish. Many rushes and flag-cattails grew around its edge. Birds and ducks flocked here; cranes, shitepokes, and pelicans sometimes were there. Muskrats by the thousands. There was an abundance of perfectly grand watercress. All in all it was a grand place to live. The Oregon Shortline railroad bounded it on the west. There were willows around the pond and it looked pretty in the winter and at Christmas time with the meadows covered with snow, and yet the pond would never freeze over and was a haven for ducks and fish the year round.”  The fact that the pond never froze in the winter suggests that it was part of an underground river. 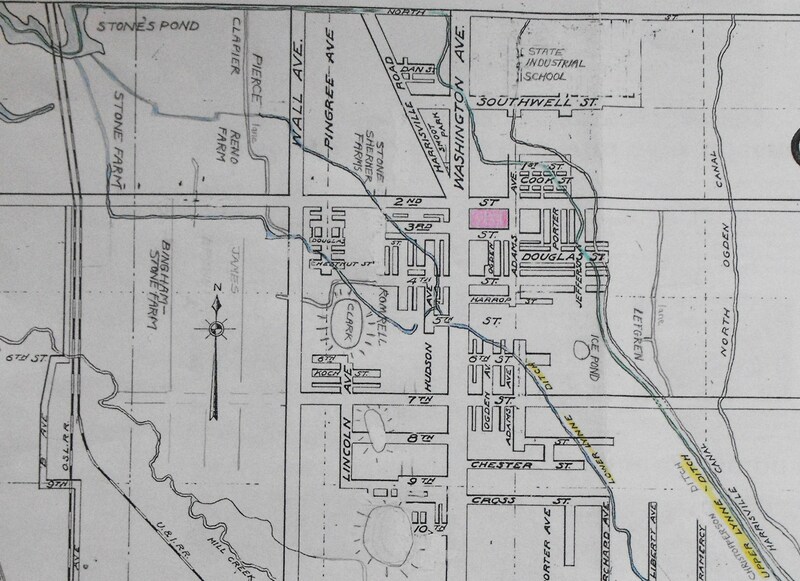 1919 map showing Stone’s Pond in upper left corner; the railroad built a bridge over a narrow portion of the pond. “I shall never forget an experience I once had while thinning a patch of beets located just south of Stone’s Pond. I especially enjoyed working by this body of water because there were so many birds in this area. I liked the melodious songs of the blackbirds and meadowlarks, the whistle of the killdeers, the quacking of the wild ducks, and the screams of the curlew snipes. One morning as I was thinning beets in that area, I noticed that it seemed to be getting darker, and I wondered why, because there weren’t any clouds in the sky. I noticed that the birds had stopped their singing, and I was puzzled. Soon it became so dark that I couldn’t see the row of beets clear enough to thin them. Then I began to realize that an eclipse of the sun was in progress. I made a few quick looks up at the sun and noticed that it was all dark except a very narrow crescent on one side. It must have been about 98% covered by the moon. The temperature seemed to drop about 20 degrees, and the birds all went to sleep for the “night”. I sat down to wait for the light to return. Soon it started to get lighter, the birds started singing again, and I could again see well enough to continue my work. John Stone (son of James Stone) was a good farmer, and owned a lot of land. I used to ride on a raft he had on Stone’s Pond. I enjoyed fishing for carp as I sailed around on the raft. One day I found a wild duck’s nest on a little island in the middle of the pond. The baby ducks had just hatched out an hour or two before. When they heard me approaching they all left their nest and swam away, even though they were only about half as large as baby chickens. One cold winter day when a group of us boys were sailing around on the raft, Orville Nordquist fell off into the icy water. He swam to the shore and ran all the way home up to 5-Points to keep from freezing to death. Stone’s Pond was drained when the Ogden Defense Depot was built in the 1940s leaving a slough on the east side of the railroad tracks. 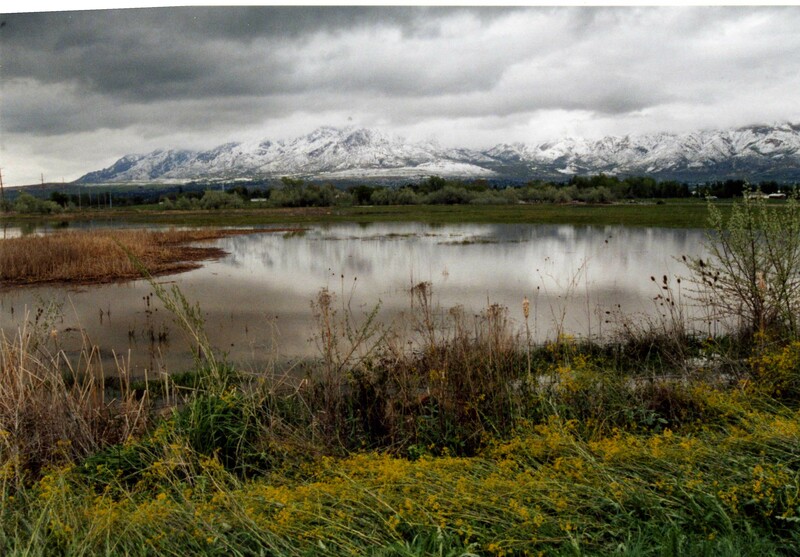 In 2004 the slough was designed into two holding ponds for the Fort Bingham subdivision. 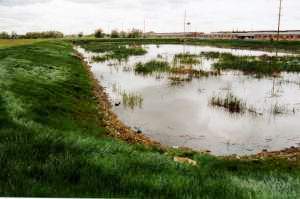 West holding pond before houses were built; photo 2005. Sarah Stone Crowther, Biography of Mary Ellen Melling Stone, hand written manuscript, c. 1930, p. 80. Memory written on the death of John Stone, 1945, by Alton Richards.